Chief Justice of Nigeria Walter Samuel Nkanu Onnoghen . A Coalition of Niger Delta agitators yesterday warned it would attack the nation's oil infrastructure if the Federal Government does not back down on its plan to arraign the Chief Justice of Nigeria (CJN) Walter Onnoghen before the Code of Conduct Tribunal (CCT). "We want to state categorically that if the presidency fails to reverse its harassment against the CJN, we will have no other option but to mobilise all the Niger Delta fighters and commence serious actions that would shake the country and the whole world." The statement reads in part: "President Muhammadu Buhari was not disposed to Justice Onnoghen's appointment to this position, which was why he refused to confirm the appointment after so many months of (Onnoghen) serving in acting capacity. It was during the period of his sickness while in Britain that the acting president, Prof. Yemi Osinbajo, confirmed the appointment. "We wish to also recall that in August last year, Mr. Matthew Seiyefa of Bayelsa State, who was the most senior and most qualified officer at the time, was appointed to the position of acting director general of the Department of State Services by Prof. Osinbajo, only to be replaced with a retired and junior officer to Mr. Seiyefa, Mr. Yusuf Magaji Bichi by President Buhari as soon as he (Buhari) resumed duties. We hereby vehemently resist any attempt to remove CJN Walter Onnoghen from office. It reads in part: "We hereby call on the president to condemn without any equivocation this assault on the CJN and the judiciary, especially coming after similar assaults on the National Assembly, to save the country from this embarrassment and global contempt. "We call on the CJN to ignore this so-called court summons from the CCB and the provocative call for his resignation in some quarters. While we are not opposed to a genuine fight against corruption, such an action must always be anchored on the rule of law. In alignment with the agitators, the governors noted: "The unceremonious removal of former acting director general of the Department of State Services, Matthew Seiyefa and his replacement is still very fresh. We note that the unfortunate action against the CJN further reinforces the perception that the Buhari administration has no regard for the sentiments of Nigerians, in particular the people of the Niger Delta, and the rule of law." He noted that the National Judicial Council (NJC) was established by Section 153 (1) & (2) of the 1999 Constitution to do just that. According to him, by Paragraph 20 (b), Part 1 of the Third Schedule, the NJC shall "exercise disciplinary control over" all judicial officers, including the CJN. "The NJC being a quasi-judicial organ established by the constitution, it is the appropriate forum to first raise any matter against any judicial officer, including the CJN. Thus, the NJC has exclusive jurisdiction over all judicial officers, including the CJN. "By the decision of the Court of Appeal, in the case of Nganjiwa v Federal Republic of Nigeria (FRN), no criminal charge can be laid against a judicial officer, including the CJN, in any court of law, without first filing such a complaint before the NJC. "The Code of Conduct Bureau (CCB) and the CCT are both part and parcel of the Federal Republic of Nigeria and are bound by the decision of the Court of Appeal in Nganjiwa v FRN. "Under and by virtue of Section 287 (2) of the 1999 Constitution, 'the decisions of the Court of Appeal shall be enforced in any part of the federation by all authorities and persons and by courts with subordinate jurisdiction to that of the Court of Appeal'," he said. "From the foregoing, the criminal charges filed against the CJN before the CCT are illegal, ultra vires, unconstitutional, null and void, and should either be withdrawn forthwith, discontinued by the Attorney General of the Federation by filing a nolle proseque, or struck out by the CCT," he added. He said: "In Nganjiwa v Federal Republic of Nigeria (2017) LPELR-43391 (CA), the Court of Appeal made it very clear that any misconduct attached to the office and functions of a judicial officer must first be reported to and handled by the NJC pursuant to the provisions of our laws. Only after the NJC has pronounced against such judicial officer can the prosecuting agencies of the Federal Government proceed against him. Foremost legal luminary, Chief Afe Babaola (SAN), in a statement yesterday, said the constitution was explicitly clear on how the CJN can be removed and described the "proposal to recuse himself from office pending the conclusion of the trial" as worrisome. "Without mincing words, I am as taken aback at this development in the same way as I was when not too long ago, the DSS invaded the homes of some judicial officers, including justices of the Supreme Court in the middle of the night on allegations of corruption. 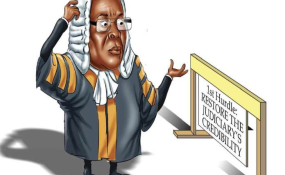 "However despite the similarity between the two events, two things place this latest development above the previous one in terms of ignominy namely; the status of the CJN as the head of the judicial arm of government and the fact that since the invasion and the rash of prosecutions that were instituted against some judges, the court, via the Judgment of the Court of Appeal in Nganjiwa v Federal Republic of Nigeria (2017) LPELR-43391 (CA) has since stated firmly the procedure permitted by law when allegations of misconduct are made against judicial officers. "Thus the point can even be made, that unlike other judicial officers who can be removed by the president acting upon the recommendation of the NJC, the CJN can only be removed by the president upon receipt of an address supported by two-thirds majority of the Senate! "On the whole, the entire episode is one that unfairly denigrates not only the judiciary, but also the constitution of the land. By proceeding as proposed, the government is unwittingly or perhaps deliberately creating a wrong impression in the minds of millions of Nigerians that the judiciary is a criminal organisation. For the sake of our democracy, this is a misconception that must not be allowed to fester." In a statement by its President General, Nnia Nwodo, the group said the action was premature and ill-conceived and warned that "our country is about to be thrown into a needless political instability that is capable of leaving the country in the throes of death." Senate President Bukola Saraki said: "If the government truly has a genuine reason to put the incumbent CJN on trial, it should ensure that every step in the process is transparent and the normal process as provided by the law is followed to the letter." In a statement by his spokesman, Yusuph Olaniyonu, Saraki faulted the Federal Government's haste on the matter, saying a short-circuiting of the process of fair hearing might have occurred. He said: "The proposed trial of the CJN has once again opened up the debate on the transparency and neutrality of the fight against corruption. The haste with which this trial is being pursued leaves a lot to be desired. From last Wednesday when the so-called petition against the CJN was initiated to the period the trial is scheduled to commence has been barely three working days, whereas there are pending cases where individuals have been indicted months ago but no prosecution is being considered." Benue State Governor Samuel Ortom, on his part, condemned the alleged attempt to gag the judiciary. "The manner in which the Federal Government is plotting to remove the CJN by rushing charges against him to the CCT and leaking the charges to the press at a weekend is suspicious, smacks of desperation, and lacks regard for due process," he said in a statement by his chief press secretary, Terver Akase. He cautioned Buhari to respect the principle of the separation of powers. "The current pressure on Justice Walter Onnoghen and the judiciary is ill-advised, unnecessary and unacceptable," he added. The APC however backed the trial, saying it was in line with its anti-corruption principle. In a statement, National Publicity Secretary Lanre Issa-Onilu said: "The swift declaration by the Peoples Democratic Party (PDP) condemning the purported move has again exposed the party as one with a natural inclination to rise up in defence of cases of alleged corruption. "Resort to baseless postulations anytime issues of corruption are levelled against public officers only confirms what Nigerians already know. PDP and corruption are Siamese twins. One would have thought that the PDP would call for impartial investigations when corruption cases are levelled against public officers. We assure the PDP and indeed all Nigerians that the President Muhammadu Buhari-led APC administration remains uncompromising in its determination to rid the country of this malady." "President Buhari has stolen your jobs. He has stolen your rights. Don't let him steal your votes. They are preparing the ground to steal your votes. I know that Nigerians are ready to 'Get Nigeria Working Again', but don't let President Buhari steal your votes," he said.